I was asked recently to teach Professional Practice to first year architecture grad students. This would be in addition to the architecture technology courses I normally teach. Despite its reputation for being at best a necessary evil and at worse a bore, I enjoy teaching ProPrac – as it is affectionately known. The standard course content includes an overview of contracts, delivery methods, finances, marketing, business development, communication, people skills. In fact, it is a well-known assumption in architecture education that once undergraduates are indoctrinated into their first courses of architecture studies, having tasted the sweet nectar of design studio, they hence split their courses into two categories: design and everything else i.e. not design. While I do teach design studio, the bigger part of my academic attention – teaching and research– is in architectural technology, construction, fabrication, building science, construction management, digital technology. In other words: not design. And yet, in order to keep the content in these courses engaging, I’ll try as often as possible to filter the topics through my 25 years of experience as a designer. And so, wherever practical, I will talk about ProPrac in terms of design. This at least gets student’s attention. 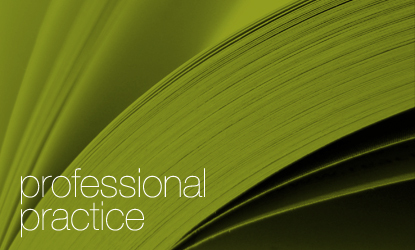 Ideally, Professional Practice wouldn’t need its own course. The course content would be covered in design studio and the “everything else” courses: building technology, structures, history and so on. These course instructors would walk over to the white board to illustrate a practice point. They’d have a ProPrac corner for a ProPrac moment or perhaps even ProPrac break-out sessions. I have a sense of what sticks and what doesn’t stick from having previously taught ProPrac for many years to architecture grad students at UIC in Chicago. And yet, this time around will be different, because I’ll be teaching the course at an interesting time. A time marked by the advent of new technologies and new delivery methods and a reshuffling of whose in charge in the profession and industry. How do you teach Design-Bid-Build when you recognize that its use is declining year by year, while at the same time more integrated methods – such as Design-Build, CM@Risk and IPD – are becoming the go-to choices for improved results? How do you discuss construction documentation knowing that the majority of firms now work in models, not drawings, making fuzzy the line between design intent and dictating construction means and methods? How do you cover the architect’s standard of care when BIM puts that term into question? How do you make the content relevant to all students when you know that 50% of them will go on to non-traditional practice? I’ll often hear practitioners complain that architecture school doesn’t teach students about running a practice, about the importance of attaining business skills or even how buildings are put together. You might have heard similar complaints – or perhaps even agree with these yourself. The thing is, sometimes I would hear these complaints from firm principals, for example about the dearth of business knowledge in recent graduates, only moments after returning to the office from having taught just these very subjects in my courses. Students are exposed to these practical topics – especially in professional practice courses. They are either just not making this known to their employers – or they aren’t carrying-over what they learned in school into the office, the proverbial academic/practice gap. Is it that the information learned in courses such as professional practice doesn’t “stick,” or because it isn’t put into immediate use, doesn’t resonate with them – and so it is soon forgotten. Some of this has no doubt been covered in the extensive reports collected by The National Architectural Accrediting Board (NAAB) for their 2013 Accreditation Review Conference (ARC13) July 17-19, in Snowbird, UT. Following the conference, the NAAB will revise The Conditions for Accreditation with a new edition scheduled for release in 2014. I attended school before professional practice course content was required for accreditation. I learned everything I needed to learn about practice from reading: books such as The Architect’s Handbook of Professional Practice (look for the new 15th edition Nov. 2013) and lesser known but equally impactful books, such as The Executive Architect: Transforming Designers into Leaders. Architect and educator Andrew Pressman has written some excellent books including a new book due out January 2014, Designing Relationships: The Art of Collaboration in Architecture. Look for it. But I recognize that students have different learning preferences and perhaps due to the forces of digital technology and social media, reading is less and less one of them. What worked for me won’t necessarily work for them. Reading gets relegated to the supplemental. In my own courses, I emphasize the importance of people skills and in order to make the material memorable as well as actionable, I try to use a variety of learning tools – storytelling, role playing, break-out sessions, hands-on exercises – so as not to reduce the learning of course content to rote memorization from a sage on the stage. As it is, students tend to compartmentalize knowledge – what happens in building science stays in building science – instead of applying what they learned in non-design courses to what they are working on in studio. In the comprehensive Capstone studio I taught last fall – teaching both design studio and technology courses – I had the unusual perspective of realizing that my students could not perform tasks as seniors that I had evidence of their performing as sophomores. Instead of accumulating knowledge, or building on what came before, it is as though the information learned in one part of the curriculum remained inaccessible or dormant – as though left behind in some unused sketchbook. For ProPrac course content to have any resonance, meaning and import – it has to find a way to be applied across the curriculum. What, if anything, do you recall from your professional practice course? What would you recommend to change about how professional practice is taught to make it more relevant for emerging design professionals?